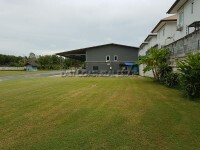 Huay Yai Private Lake 18 Rai land plot. What a stunning opportunity! Your chance to own a large development plot, which has been cleared & filled and offers a central landscaped private lake. This would make the perfect setting for either a small housing development, or a lakeside resort. Located less than 1km from the main (K9) road which links the Huay Yai district with the Mabprachan lake area, this position is well situated for schools, highway access, sports clubs, restaurants and various other hobbies. The beaches of Jomtien are just 15 minutes away too. There is already a schedule to complete the road directly to the plot, and this will also bring electricity once complete. Owned in Thai Name with all taxes and transfer fees split equally 50/50.